Colour selection made easy. With the colour wheel (ColorWheel) you can set the HSL components independently of each other. The big wheel shows all hues of the rainbow (and even some more). Clicking on it moves the selection marker to a different position. The two remaining dimensions saturation and lightness for the selected hue can be selected in the centre square. 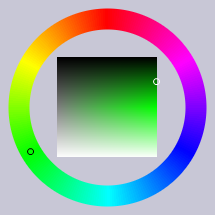 The following image shows the colour selection with a ColorWheel control. Here the colour dark green (#008000) is selected. You can set and get the selected colour from code with the Hue, Saturation and Lightness properties. Conversion between the RGB and HSL colour space is provided by the ColorMath class. The ColorWheel control is also used in the ColorSelector and thus also in the ColorButton control and in the Farbeimer application. You need the ColorMath class to use the ColorWheel control.